Goal: To improve mental health through prevention and access to services for the residents of the trip-county region. Reduce substance abuse among tri-county residents, especially youth. 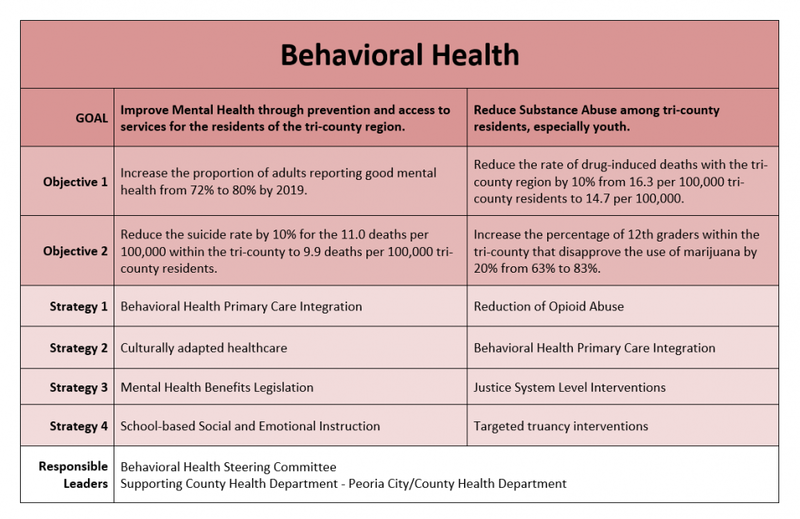 Behavioral Health was prioritized by all three counties. The Behavioral Health Committee purpose was to create a goal, objectives and strategies around access, mental health, substance abuse and suicides. This group met a total of five times to finalize the dashboard that is presented in the Community Health Improvement Plan (CHIP). The Behavioral Health Committee created a steering committee to implement the CHIP forward due to the complexity of the priority. The Steering Committee members include: Beth Derry, Peoria Regional Office of Education; Cheree Johnson, Advocate Hospital; Dean Steiner, Unity Point Health, Diyva Joshi, OSF Healthcare; Joanie Montoya, Advocate Eureka Hospital; Kati Johnston, Peoria Police Department; Mike Eeten, Pekin Police Department; and Nancy Hinnen, United Way with the support of Peoria City/County Health Department. Goal: To reduce the illness, disability and death caused by breast and lung cancer in the tri-county area. Breast and Lung Cancers were selected as top priorities for Tazewell and Woodford Counties. The Cancer Committee was formed to create a goal, objectives, and strategies around these cancers. This group met a total of five times to finalize the dashboard that is presented in the Community Health Improvement Plan (CHIP). 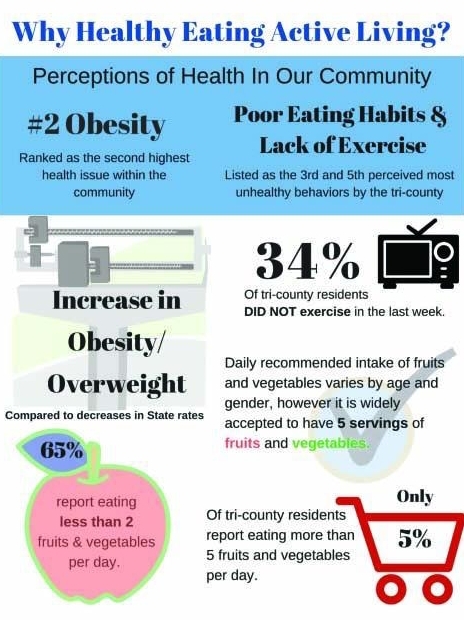 The group identified Anne Bowman, Unity Point Health and Azza Mohammed, Tazewell County Health Department to co-chair this group with the support of Woodford County Health Department and implement the CHIP for the next three years. Goal: To improve and promote reproductive and sexual health of adolescents and young adults. Reproductive Health was prioritized by Peoria County to focus on teen birth, Sexually Transmitted Infections and Low birth rates. The Reproductive Health Committee was formed to create a goal, objectives and strategies around these issues. The group met a total of five times before finalizing the dashboard to submit in the Community Health Improvement Plan (CHIP). The group identified Melissa Adamson, Peoria City/County Health Department to chair this committee and implement the CHIP for the next three years. Click here to visit the CenteringPregnancy in Peoria website. The Reproductive Health meeting is going to be at 2pm at Manual high school on Nov 28th (instead of 3pm at PCCHD as listed on our 2018 meeting schedule). The December 26th meeting has been cancelled. A 2019 meeting schedule will be posted in the next couple weeks.